I can’t promise to do a layer cake every weekend, but this one seemed perfect for the Fourth of July holiday: fresh summer fruit, easy butter-cake procedure, light cream-based frosting, and oh, did I mention, it’s red-white-and-blue? What could be more appropriate? 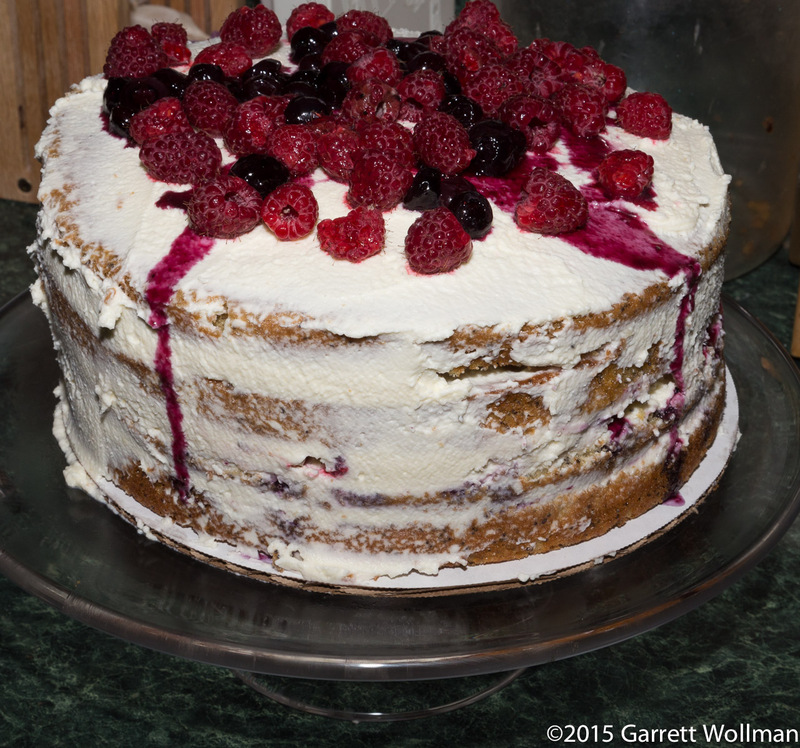 The recipe is Berry–Crème Fraîche Cake, from Emily Luchetti’s A Passion for Desserts (Chronicle Books, 2003; p. 69). Like any butter cake, it’s made by the creaming method, so we have a wet team, on the right, and a dry team, left; the wet ingredients consist of butter (half a pound, 225 g), sugar (2 cups, 400 g), cultured non-fat buttermilk (1 cup, 240 ml), two teaspoons of vanilla, and four large eggs. The dry ingredients are flour (11¼ oz, 320 g), a quarter-cup of poppy seeds (about 80 ml — I didn’t weigh them out), half a teaspoon of salt, and one teaspoon each of baking powder and baking soda; the soda is there to neutralize the acidic buttermilk. All the dry ingredients except the poppy seeds will be sifted together before adding to the batter. Again following the usual creaming method, the butter and sugar are beaten together until light and fluffy, then eggs are beaten in. 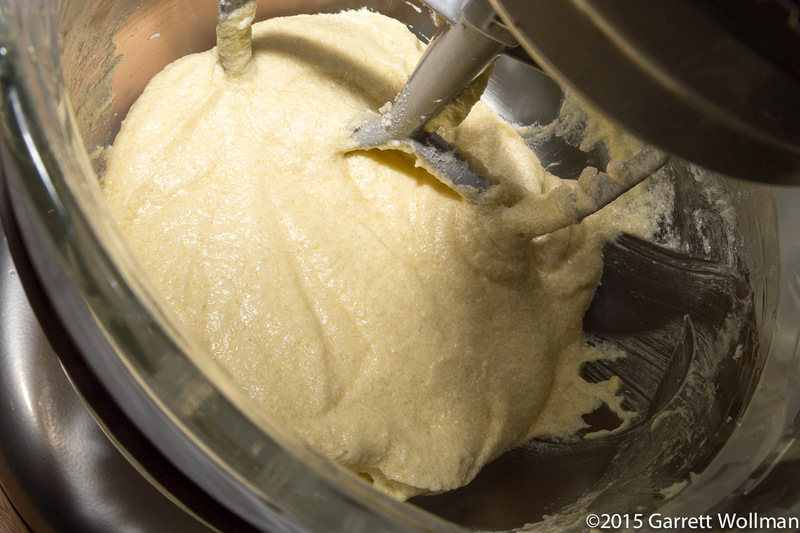 As is often done for cake batter, the additional liquid (buttermilk) is added in stages, alternating with the combined dry ingredients; in this case, the vanilla was mixed with the buttermilk prior to adding to butter-egg base. (In fact, at the last minute I swapped out vanilla paste for the vanilla extract shown above, using a whisk to thoroughly combine it with the buttermilk.) The poppy seeds are stirred in at the very end. Again following the usual procedure, the cake batter is divided evenly between two nine-inch (230 mm) round cake pans, which I had previously buttered and lined with a disc of baker’s parchment. 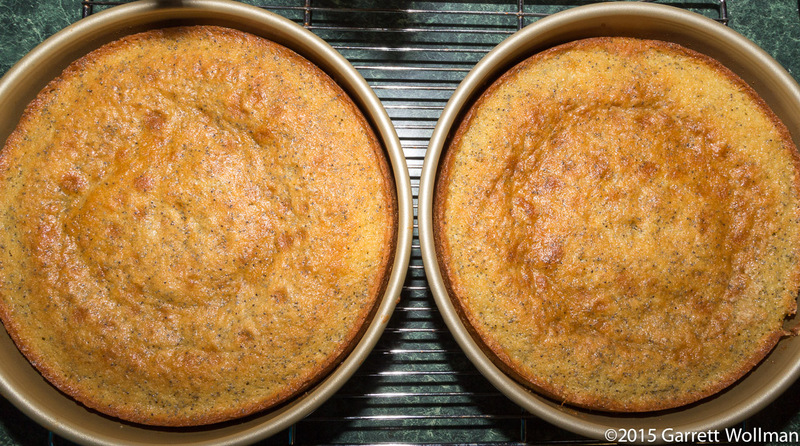 The recipe says to bake at 350°F (175°C) for only 15–20 minutes, but after that short a time, the center of my cakes were still liquid — it took just about 30 minutes total. After cooling in the pan for ten minutes or so, the cakes are turned out onto their tops. I found that mine did not require leveling. Here’s a view of the side of one of the cakes; you can see it’s actually pretty flat. Incidentally, these are very moist and tasty cakes even without the filling; below I’m presenting the nutrition data for the cakes alone in addition to the full recipe as Luchetti gives it — I could easily imagine having the cake alone, with plain whipped cream, confectioner’s sugar, or a simple fruit sauce. Once the cakes were completely cooled, I wrapped them in plastic and sat them (for lack of a better place) on top of my cake stand. While the cakes were cooling, I made the blueberry sauce — which is just a pint of blueberries simmered for a while with some sugar — and put it in a plastic container to chill in the refrigerator. The only other sub-assembly for this recipe is the whipped crème fraîche frosting, which must be made immediately before final construction. Unfortunately, I didn’t take any photos of the intermediate stages of cake construction. First I made the filling by whipping together 16 ounces of crème fraîche, two-thirds cup (160 ml) heavy cream, and a couple tablespoons of sugar. Then, I split the two original cake layers, to make four layers in all, and used an offset spatula to spread a quarter of the cream filling on each layer, alternating with the blueberry sauce and fresh raspberries (which I had rinsed and dried in a salad spinner). The recipe calls for a pint of raspberries; I’m not sure what volume I actually used. I had a little of the cream left over, so I spread a bit on the sides, but there was not enough to completely cover the sides — the picture in the cookbook doesn’t seem to show frosted sides. 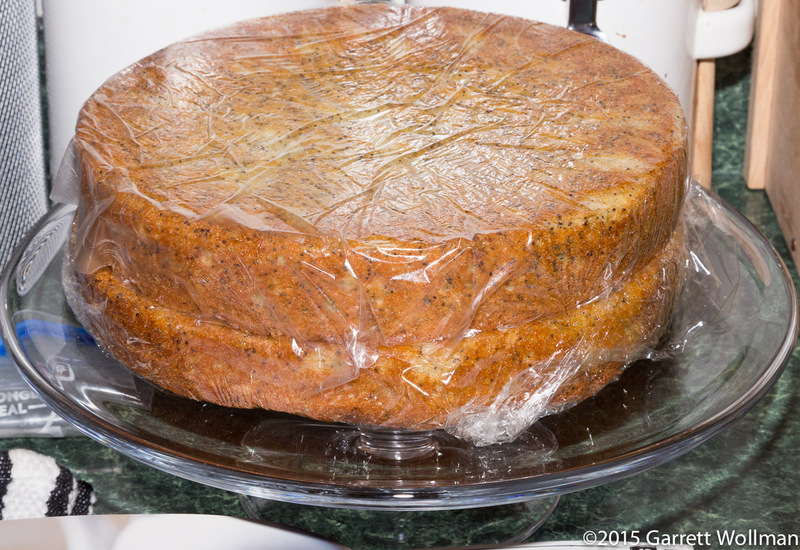 This entry was posted in Food and tagged cake, Emily Luchetti, recipe. Bookmark the permalink.